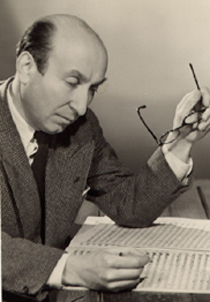 Mischa Spoliansky was born in Bialystock (Russia) on the 28th December 1898 to a musical family. His father was a baritone with the opera in Bialystock, his brother Alexander became a cellist in the Warsaw Symphony Orchestra and his sister Lisa became a concert pianist after being a master pupil of Artur Schnabel’s. When Mischa was six years old his mother died and his brother and sister moved to Berlin to continue their musical careers. Mischa stayed with his father, eventually settling in Dresden where he was introduced to Professor and Mrs Mark Guinsberg, both renowned concert pianists. Impressed by his musical talent, the Guinsber’s took Mischa as a pupil. Orphaned at age 11 Mischa went to Konigsberg to live with friends of his father. In 1914, he was sent to Berlin to join his sister. He studied at the Stern'sche Conservatorium. Later he joined his brother’s trio as pianist at the famous Café Schön, Unter den Linden. Spoliansky played in the Chamber orchestra of the UFA Theatre in the Friedrichstrasse and the Mozart Saal at the Nollendorfplatz. Victor Hollaender, the father of Friederich, was impressed by Mischa’s music and piano playing and with Werner Richard Heymann asked him to join them at the literary cabaret Schall und Rauch based in the cellar of the Grosses Schauspieilhaus. There Spoliansky composed for lyricists including Walter Mehring, Kurt Tucholsky, Klabund and Joachim Ringelnatz. In 1922 Spoliansky met the writer Marcellus Schiffer and began a successful partnership and close friendship. On his return to Schall und Rauch, Spoliansky met Max Reinhardt for whom he wrote the music for Victoria, based on Somerset Maugham’s Home and Beauty. It was a great success in Berlin, Vienna and Salzburg. He also wrote the show Es liegt in der Luft for Reinhardt, with book and lyrics by Marcellus Schiffer. Mischa’s close friend Marlene Dietrich made her stage debut in this show. In 1928 Robert Klein commissioned Spoliansky and Georg Kaiser to write a revue Zwei Krawatten. It starred Marlene Dietrich. Joseph von Sternberg was in the audience at the premiere and immediately signed Dietrich for the film The Blue Angel. Two years later Spoliansky’s musical, Wie werde ich reich und glücklich (“How Will I Become Rich and Happy”) was produced at the Komödie playhouse on the Kurfürstendam in Berlin. It is said that Richard Strauss and Arturo Toscanini both knew and loved this show. Between 1931 and 1933 and in collaboration with Schiffer, Spoliansky wrote Alles Schwindel, Rufen Sie Herrn Plim, Das Haus dazwischen and 100 Meter Glück. In 1933 with his wife and three small daughters, Spoliansky was forced to leave Germany. They arrived in London and became British citizens. Spoliansky’s output includes more than 50 film scores. Among them are Sanders Of The River and King Solomon’s Mines, both starring Paul Robeson; The Ghost Goes West, North West Frontier, Trouble In Store with Norman Wisdom; Wanted For Murder with Eric Portman; The Happiest Days Of Your Life with Alistair Simm and Margaret Rutherford; Otto Preminger’s Saint Joan, and The Best House In London with David Hemmings. In 1978, at the invitation of the Berlin Arts Festival and at nearly 80 years old, Spoliansky performed a concert of his music with his Margo Lion, the widow of Marcellus Schiffer. Acclaimed by a packed audience of all ages, he was invited to make a return visit the following year. York University holds a concise archive of Mischa’s English works including a number of original documents. The Akademie der Künste in Berlin has an impressive library of his work up to 1933. Spoliansky is also featured in a permanent exhibition in the Jewish Museum in Berlin. In 1985 Mischa Spoliansky died peacefully in his own home in London.